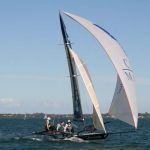 The 18ft Skiffs are looking to catch up on abandoned races due to the recent wild weather, and use the scheduled “spare” weekend this Saturday 23rd October. Please get in touch with Paul C for details. All Historical 10ft Skiff skippers and crew are advised that the Prestige Cup races at Sandgate will be postponed to a future date. Racing will occur at Bulimba as usual in an attempt to catch up on the race programme. A revised programme will be advised in due course.